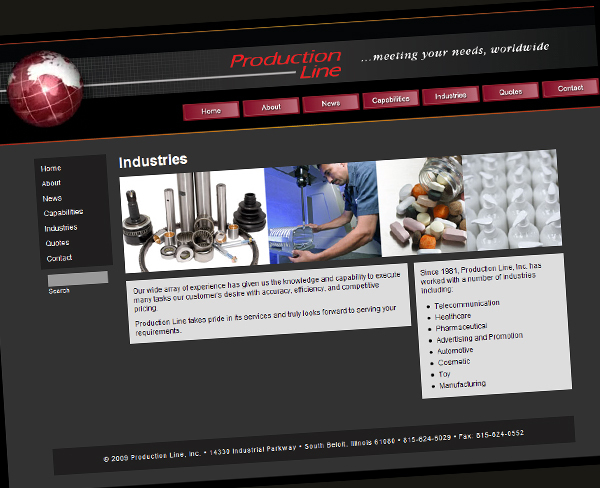 Production Line web site launched! If you're reading this, you have arrived at www.productionline.com, a communications tool we hope you will find useful in your current or prospective relationship with our firm. Our new site will feature special announcements, profiles or our people, highlights of the services we provide and news about our contract assembly, custom manufacturing, packaging services and more. Another feature is a QUOTES link . It’s a quick way to get information to us so that we can respond even faster to your project needs with costs and specifications to help you get your assignment underway as soon as possible. You can upload CAD files, PDFs of drawings, or documents that make quoting your project a faster, more accurate process than phone or fax. We also encourage you to use the CONTACT US link if you require immediate response (in case the person you’re attempting to reach is not in his/her office), or if you don’t know who to contact at Production Line. Please let us know your thoughts and any questions about or recommendations for improving our web site. We’re excited to share more information with you, so please feel free to visit often. Best wishes for a successful year-end, and a prosperous 2010!